West Lancashire Football League side Thornton Cleveleys continue to enjoy success on all fronts as they edged into the semi-finals of the Lancashire FA Amateur Shield. They required penalties to do so after coming from behind to draw 2-2 at home to Hurst Green in their last eight tie. 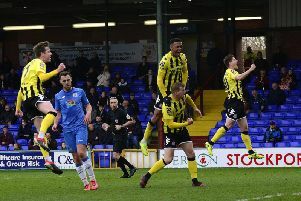 Joel Phelps handed the visitors the lead after just 15 minutes and they found themselves two down at half-time when Tom Jackson added a second just before the interval. But Thornton took the game to spot-kicks after Oliver Wilkinson and Ryan Walmsley got their names on the scoresheet, with the home side winning 6-5 on penalties. They also remain top of the league in the Premier Division, where Blackpool Wren Rovers could only close the gap by a point after drawing 1-1 at home to Euxton Villa. Carl Eastwood put them ahead just nine minutes from time, but they were cruelly denied in the last minute when Mitch Newsham levelled for Euxton. In division one, bottom-of-the-table Wyre Villa earned their second victory of the season with a hard-earned 2-1 win against second from bottom Askam United. Josh Draycott got both of Wyre’s goals, while Callum Rayner netted for Askam who are now just four points ahead. Wyre are now on zero points having being docked seven points for fielding an ineligible player. Lytham Town were unable to hold on to their lead as they drew 3-3 with Kendal County. Cameron Stewart scored early on for the visitors Kendal, who were pegged back by Ross Ainsworth’s equaliser on the half hour mark. Gareth Lowcock put Lytham ahead just before the interval, with Danny Lenehan making it 3-1 halfway through the second half. Connor Walmsley immediately pulled one back for Kendal before Harry Routledge levelled things up two minutes from time to see the points shared. The seemingly unstoppable New Albert lost their unbeaten record in the Bathroom Solutions Blackpool and Fylde Sunday Football Alliance First Division with a 5-1 defeat to Layton Pub. Arron Clarke and Rick Fisher grabbed a brace each and Shane McLeod completed the scoring, while Lee Grundy was on target for Albert with their consolation goal. Anchorsholme had the chance to go top but fluffed their lines as they were held 2-2 in their match at FC Kingsfield. Paul Drinnan and Arran Smith scored for Anchorsholme with Michael Crossland and Aran Bottomley doing likewise for the hosts. West View also won, 5-3 at Clifton Rangers thanks to goals from Daniel Warren (3) Jonathan Gough and Ellis Tester. David Smith, Blaine Heughan and Kenny Cram replied. In the only Premier Division game played, Appletree Finance drew 2-2 with Exceptional Kitchens as Jordan Brownlee’s double for Appletree was cancelled out by Kyle Hendry and Kyle Pieri. In the Second Division, Layton Seniors also lost their unbeaten record as Highlands made themselves real title challengers by winning 5-4. Goals for the winners came from Richard Blampied (2), Craig Wharrie, Andrew Houghton and Steven Clifford. Those strikes meant that Ben Reader’s effort and Alex Ryder’s hat-trick were ultimately in vain. This result also meant that the Mount extended their lead at the top in a match with the same scoreline against a much improved Blackpool Elite. Kieran Hindle scored twice with further goals coming from Jack Williams, Dom Ritchie and Ben Gibson. Matty Graffin, Luke Thomas, Kieran Stott and Kyle Magee then found the net in reply. Matty Grime scored four as his AFC Lane Ends Blackpool team ran out 7-0 winners in their match against Kirkham. Jack Yates and an Ashley Casey double completed the scoring. Lee Fleetwood and Stuart Hammond scored as Marshall Court beat Fylde Rangers 2-1, Kieran Wilson replying. Anchorsholme moved up to fifth in the Premier Division of the Mid Lancs League, thanks to a 4-2 win over Eccleston & Heskin. This was very much a game of two halves, with Anchorsholme seemingly certain to claim three points at half-time. They led 3-0 thanks to Darren Heaney, Kieran Rimmington and a fabulous solo effort from Will Donegani but credit must go to their opponents after Eccleston changed formation at half-time. Complacency nearly cost the Anchors three points as Eccleston grabbed two well-taken goals and were pushing for an equaliser. However, five minutes from the end, Heaney deflated Eccleston by tapping in a Ryan Holland cross to secure the points for his fourth in two games and Anchorsholme’s third victory on the bounce.